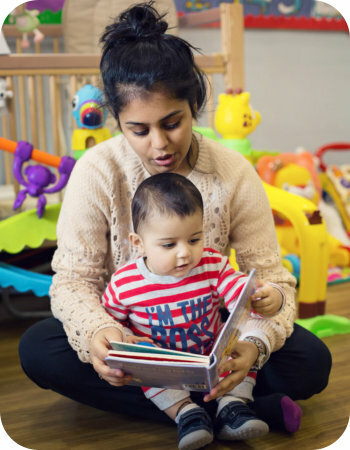 We work closely with all parents and carers and understand that this partnership is crucial to a child’s well-being, learning and development. Parents and carers know more about their child than anyone else. They are the most important persons in their child’s life. We respect, understand and value the contribution they make to towards every aspect of their child’s development. Accordingly, we wish them to play an active role in their child’s journey through our nursery, and will provide them with the support, guidance and encouragement to act as educators. Parents and carers are apprised of their child’s progress and provided with information regarding the curriculum, activities and events through a variety of sources: daily discussions with members of staff; entries in children’s daily diaries; written reports on their child; regular newsletters; a dedicated parent’s noticeboard; and parents’ evenings. All members of staff, especially a child’s Key Person, room leader and the Nursery Manager, will always make themselves available to discuss a child’s progress and any specific questions a parent or carer may have. In our experience, regular discussions of this nature form the basis of an effective partnership between parents or carers and the nursery. We ask that parents and carers leave comments in their child’s daily diary. All comments are of great value in helping us to ensure that our planning takes full account of a child’s individual needs. Staff will compile written reports on the progress of each child and will be available to discuss them with parents and carers as necessary. The reports will be used to provide advice on how best to advance a child’s learning and development at home. Parents’ evenings, which are held twice a year, enable staff to provide parents and carers with a comprehensive review of their child’s progress. They also provide the opportunity for a detailed discussion of how a child’s individual needs may best be met in the future through carefully structured planning. Excellent Pre-school, my daughter has thoroughly enjoyed her time here and I would recommend to anyone. Brill attention to detail and knowing the children well.